Still plugging along, mostly finished with Murder Ink which I’ve been browse-reading my way through. 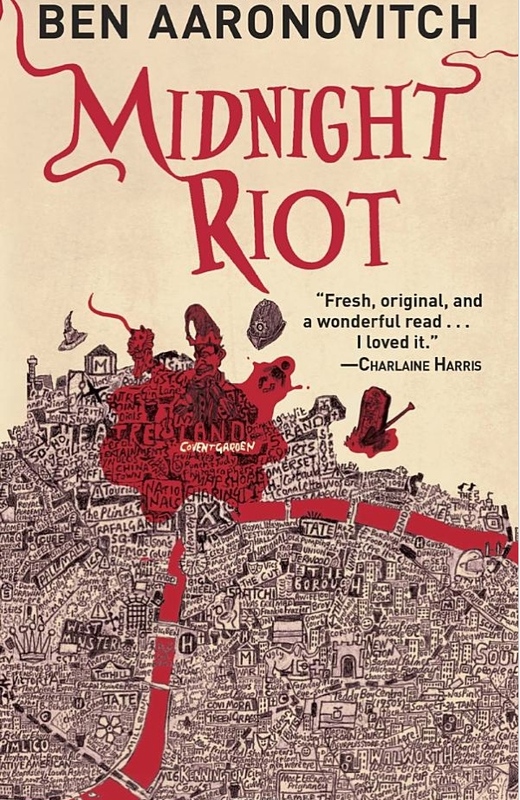 I’m also nearly finished with Ben Aarnovitch’s Midnight Riot (UK title The Rivers of London) about a Detective Chief Inspector who does magic and his new apprentice, Constable Peter Grant. I’m liking it, and will move directly on to the next book in the series, Moon Over Soho. Barbara has been busy and her reading time limited, but she’s nearly finished with Henning Mankill’s Sidetracked. Next up is one by Jeffrey Deaver. I’ve heard some good things about Aaronovitch’s books and I’m glad you’re enjoying them, Richard. I’ve added his name to my Gotta Read Him Someday list. Various activities overtook my reading this week. I did zip through another three Batman graphic novels (while mumbling about how complicated the lives of comic book heroes have become) and the two Whispering Gorilla stories that comprised my Forgotten Book this week. Definitely not your cup of tea was Paul Tremblay’s latest, A HEAD FULL OF GHOSTS — a twisty turny, well-written, fast-paced horror novel about the aftermath of an exorcism. A good book that walked the fine line between “Is it real, or is it Memorex?” territory. I also read Joseph Fink and Jeffrey Cranor’s WELCOME TO NIGHT VALE, an outrageous fantasy novel based on the popular bi-monthly podcast. Night Vale is an isolated desert town where strange and weird things are the norm and where librarians are deadly, houses philosophize about the hidden meanings of orange juice, and all angels are named Erika. The story centers on eternally nineteen-year-old pawn shop owner Jackie, PTA mom Diane, and her fifteen-year-old shape-changing son. lt’s wildly inventive and darkly funny, yet I had trouble reading the book’s 400 pages. What works well in a brief podcast can become burdensome in a full-length novel; I fpund I had to read the book in stages of twenty pages or so — something completely unusual for me. But then, the book itself was unusual and well worth my effort. It rained like stink here for the past four days, with thunder and lightning (and possibly trolls). Today may be better, though — something that’s not often said about Mondays. Hope you have a glorious week with good reading and good gardening. I think you’ll enjoy MIDNIGHT RIOT when you get to it, Jerry. Yes, the lives of comic book heroes have become strange and complicated. I think I liked older, simpler times, when lines were more clearly drawn and the reader knew what to expect. Come to think of it, the same is true with most fiction these days. I have but haven’t read that double Whispering Gorilla book. Listening to podcasts is something I’ve done very little of. Interesting they would base a novel on one, but what the… Not sure I’d like a book that made me read it as if it was a series of short stories. Sorry to hear of your downpours. It’s been rainy on and off here, still very wet, but we’re promised four days of sun starting later this week. I tried to do a little gardening, and pulled my back, so I’ve been gimping about like an old guy. But then I AM an old guy. That Aaronovitch book is on my radar too, but my library doesn’t have a copy. May buy. Not a lot of reading this week with a lot going on, but I have TEN library books on hand (don’t ask) and I’m reading another I’ve downloaded to the Kindle (after a George Kelley review), Andy Martin’s REACHER SAID NO. He got Lee Child to let him observe Child in the act of creating and writing his last book, MAKE ME. It is interesting but, to me at least, not compelling. The one (library) book I did finish was Joe R. Lansdale excellent collection of stories and novellas, HAP AND LEONARD. Great stuff. I’m currently reading David Denby’s intersting LIT UP, about a year he spent observing a 10th grade English class in a special NYC high school, in an attempt to see if there is a way to get kids to actually want to read. I’ve got the Martin Edwards collection, SERPENTS IN EDEN, another George Kelley recommendation, SHADOW SHOW (stories in celebration of Ray Bradbury), Sheila Weller’s GIRLS LIKE US: Carole King, Joni Mitchell, Carly Simon – and the Journey of a Generation, plus several mystery and fiction titles. We’ll see how much I actually get read. Jeff, MIDNIGHT RIOT is the only one in the series the library had in book form, but they have the others in ebook, so I’ll borrow the next one that way. They also have them in audiobook. Seems we all are having a slow reading time this month. Maybe April will be better for you (not for me, I’m afraid). Of the books you list, the Edwards is the only one I have on hand. Still slogging through STATION ELEVEN and doing final copy edits on my own book. Phil is reading NABOKOV IN AMERICAN, which he is really enjoying. He also enjoyed the crime book, DRAGONIFISH by a Vietnamese writer. Since you characterize your reading of STATION ELEVEN as “slogging”, I’m going to assume you’re not enjoying it very much. DRAGONFISH is a new one to me. Always good to see what folks are reading! That’s the beauty of these Current Reading posts every Monday, Charles! I don’t know DRAGONFISH either. I’m back from our trip to Boston so it’s all about Big Fat books this week as I enjoy SPRING BREAK. I hit a bookstore in Brookline and bought a bag of books. They’ll be showing up on my blog in the coming weeks.